The Lowrance Hook 3X fish finder offers a good return for the money and offers a lot of features at an economical price. It lacks GPS but saves you 50-60 bucks if you don’t really need it. Mounting and operation are easy and the kit comes with all the required accessories. Product rating is great on Amazon with so many great reviews and Lowrance backs this unit with a one year warranty. 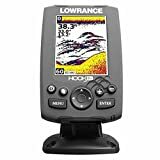 The Lowrance 000-12635-001 Hook-3X Sonar, W/ 83/200 XDCR was designed primarily to serve inshore fishermen and it works great to analyze depth, temperature, and graphics. This unit lacks GPS but it is a great buy for the price. The 3.5” LED backlit display offers an excellent view from different angles. Instead of fish arches, it displays fish echoes as symbols but fish ID is not always accurate. This compact fish finder may display any suspended debris or a structure as fish. It comes with a transducer with built-in water temperature sensor. Hook also includes track and alarm options. We picked this unit for the excellent features vs price ratio and excellent ratings. The display of the Hook-3X Sonar fish finder is readable even under direct sunlight and has a resolution of 320×240. It has 11 controls on the front, which include a keypad, frequency changer, menu settings, zoom keys and power button. It can distinguish between objects by differentiating strong and weak echoes. Hard and soft returns are represented by yellow, red and blue color lines. Depth is adjustable if you wish to decrease the range for fishing only. It supports 200 kHz and 83 kHz frequencies that are adjustable from frequency key. Using advanced signal processing, the noise rejection feature filters out the noise of boat pump, ignition system, water, etc. You can also adjust ping speed according to the velocity of a boat. It also helps reducing interference coming from other transducers. Default settings are best in normal fishing conditions but you can tune them according to your specific requirements. The unit is IPX7 certifies and waterproof. It operates on 12V with a transmission power of 100W RMS. The length of the transducer cable is 6m so you can install transducer easily. The max speed is 70 mph and high frequency lets you navigate water with maximum control. Sonar operation of 83 kHz offers 60° conical coverage to capture larger area while 200 kHz provides 20° coverage which is ideal for drop shooting methods. Featuring track and alarm options, the pages button allows switching between frequencies quickly. The backlight is adjustable up to eleven levels. The mounting system of this unit is not very strong but it works fine if it is adjusted properly. It lacks Ethernet or wireless connectivity but it’s still a good choice for self-starters who want to get a good grip on radar techs and usage. Packed with all basic functions, the Lowrance 000-12635-001 Hook-3X Sonar is an excellent choice for inshore fishermen. Once you get a good grip on frequency settings and other adjustments, you will absolutely love this unit. It makes it easy to see gamefish and baitfish targets and comes highly recommended if you are looking for a basic radar unit at an affordable price.